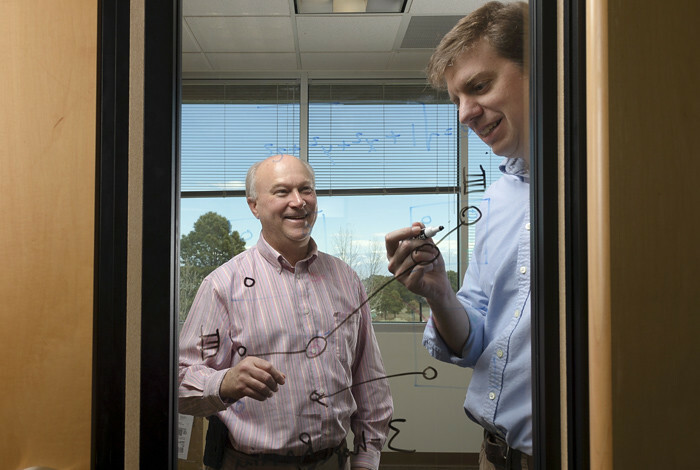 Gary Grider, left, and Brad Settlemyer discuss the new Los Alamos and Carnegie Mellon software product, DeltaFS, released to the software distribution site GitHub this week. LOS ALAMOS, N.M., March 14, 2019—A new distributed file system for high-performance computing being distributed today via the software collaboration site GitHub provides unprecedented performance for creating, updating and managing extreme numbers of files. DeltaFS builds a file system that appears to the user just like any other file system, doesn’t require specialized hardware, and is exactly tailored to assisting the scientist in new discoveries when using a high-performance computing platform. The file system brings about two important changes in high-performance computing. First, DeltaFS enables new strategies for designing the supercomputers themselves, dramatically changing the cost of creating and managing files. In addition, DeltaFS radically improves the performance of highly selective queries, dramatically reducing time to scientific discovery. DeltaFS is a transient, software-defined service that allows data to be accessed from a handful up to hundreds of thousands of computers based on the user’s performance requirements. “The storage techniques used in DeltaFS are applicable in many scientific domains, but we believe that by alleviating the metadata bottleneck we have really shown a way for designing and procuring much more efficient HPC storage systems,” Settlemyer said.